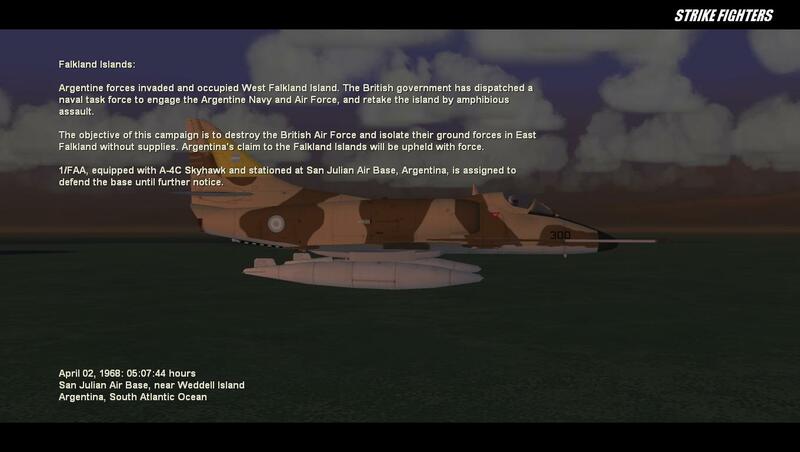 The campaign is Falkland Islands 1968. 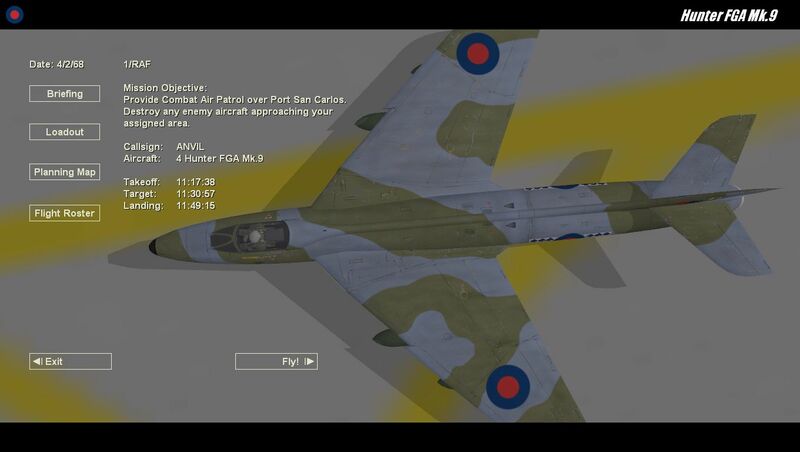 It features several RAF Hunter FGA Mk.9 squadrons against 7 Argentine squadrons, all A-4C, P, and Qs. 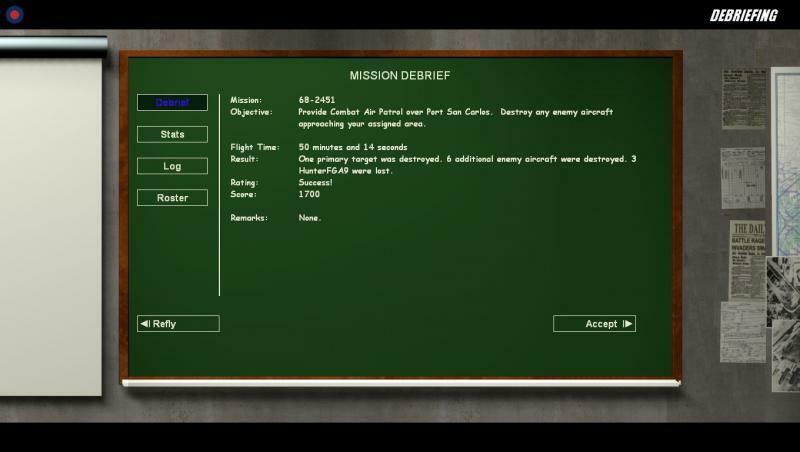 Missions are usually CAP or Anti-Shipping. 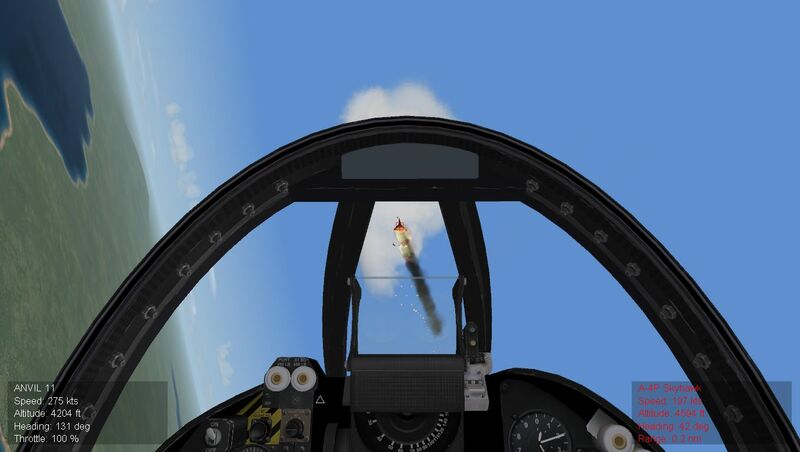 There are no IRMs in the game, and each mission is tough and some are just downright exhausting.Your wingies are not much help. And where are based the Hunters? Aj, sorry, just saw it. Well for some reason, I wanted to overhaul my Falkland Islands campaign. The terrain includes the Mt. Pleasant AB and I always assumed I would have a 85 campaign, or even a 82 campaign to match the actual conflict. And I have set up several campaigns along the way. But, overtime, I just never added the necessary add-on aircraft for those campaigns. 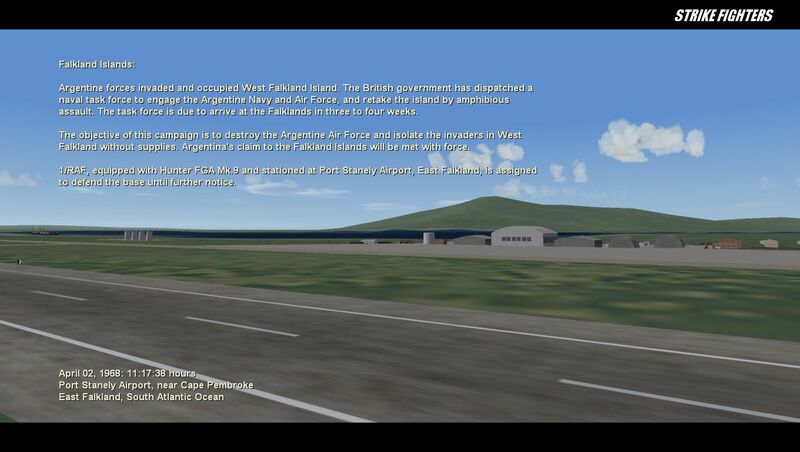 I have a stock WoV-WoE installation with a few extra custom terrains, the Falklands being one of them. 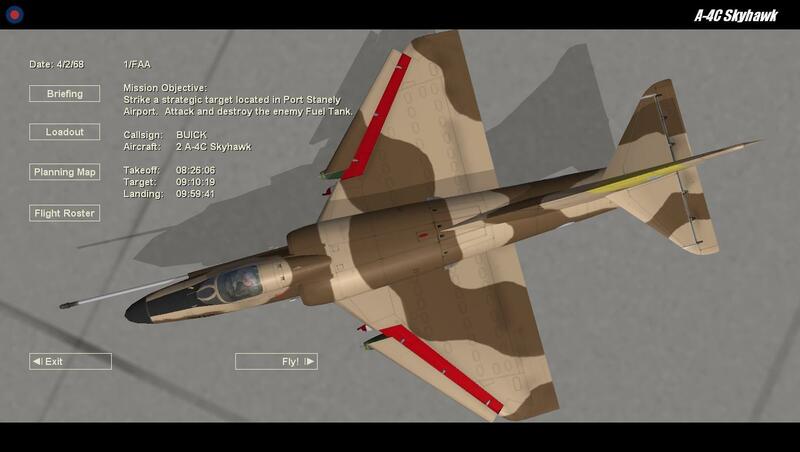 So, it occurred to me that I should re-make a campaign that utilized the stock Hunters and Harriers either each aircraft individually, or perhaps both in the same campaign. I wanted to reduce the number of squadrons, and it would be really the RAF vs the FAA. (i.e. no Sea Harriers or Sea Hunters ). But, I found the following, and therefore I am trying to figure out the right mix of FAA stuff (all A-4s), and what year might be right for the campaign. In 1965, Argentina contracted to purchase 50 surplus U.S. Navy A-4B Skyhawks for the Argentine Air Force (Fuerza Aerea Argentina, or FAA). After the aircraft were reworked at the Douglas facility in Tulsa, OK, they were redesignated A-4P "Caza" (Hunter). Twenty-five A-4B/A-4Ps were delivered to the FAA in 1966 and another 25 (A-4B/A-4P) were delivered in 1970. Argentina also purchased four A-4Bs (BuNos 144894, 144932, 145017, and 145053) for FAA non-operational use as spare parts sources. In Argentina, these aircraft will simply known as "Bravos". In 1975, Argentina purchased an additional 25 A-4C Skyhawks for the FAA. In 1994, Argentina contracted to purchase 36 surplus A-4M Skyhawks, to include engine refurbishments, rewiring, and avionics upgrades. Delivery of the refurbished aircraft, redesignated A-4AR Fightinghawks, began 1997. CANA (Commando Aviacion Naval Argentina) purchased A-4B Skyhawks in 1971. These A-4B were reworked at Tulsa, Oklahoma. Argentina designated these reworked airframes A-4Q. CANA assigned numbers 0654 through 0669 to its 16 A-4Q aircraft, the numbers being painted on the vertical stabilizer. In addition radio call signs of 3-A-301 through 3-A-314 were painted on both sides of the mid-fuselage. 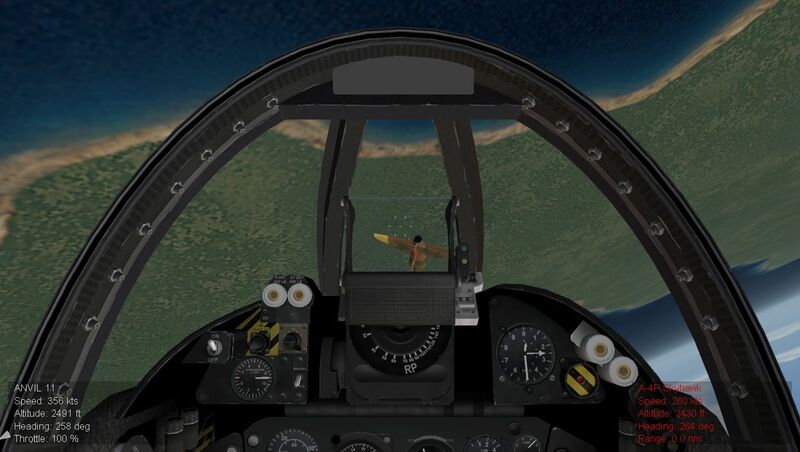 So do you guys know of a FAA (the other FAA ) skin for the stock Harrier GR1 or GR3. I will look again, but me thinks I have never run accross one. Some other particulars that might be important or NOT. According to the in game stock Hunter FGA data file, the service end data is 1969, which I take to mean RAF service end date. The Harrier GR1 and GR3 have service start dates of 1969. So, it might mean that 1969 would be the only date to have both birds. But then, the rest of the FAA A-4Ps dont arrive until 1970, and the A-4Qs dont arrive until 1971. In the campaign, the Mt. Pleasant AB has a start date of 1985, so therefore not available until then. So I thought I would make the campaign date either 1968 or 1969, and just do the following, right or wrong. BTW, all forces are playable. So, I don't mind having these smaller "excuse me" "what if" campaigns. They are easy to put together, test, and play. I did reduce the verbage in the start screens, which I always like, and looks like the Argies get right to it. Well, it was a lot of fun using the Hunters in the Falklands, but it just feels weird for some reason. So, I went back to what I had in the 82 campaign, just not as many birds. But now I set the campaign year to 1972, which is a much better date to support the first gen Harriers, and all the Argie A-4 stuff. One problem for the Brits, the GR.3's get booted back to the 9B sidewinder because it's 1972. If you want to play without IRMs you can just select the GR.1 squad, so it now looks as follows. Where can one download this campaign? Can you post a link here please?